By actor, comedian, and voiceover artist Eddie Deezen. Visit Eddie at his website or at Facebook. 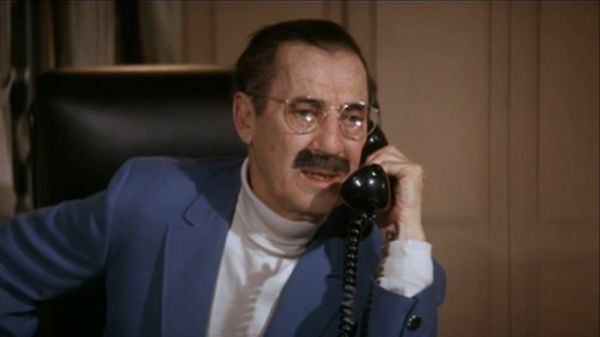 In 1968, Groucho Marx signed on for the final movie role in his legendary career. Groucho agreed to play a mobster called “God” in a terrible movie called Skidoo, directed by famed director Otto Preminger. The film starred Jackie Gleason and Carol Channing. It also featured an all-star (and eclectic) cast including Mickey Rooney, Burgess Meredith, Cesar Romero, Frank Gorshin, Peter Lawford, George Raft, and Frankie Avalon. The fact of Gorshin, Romero, and Meredith all appearing would indicate some kind of Batman love by either the film’s writer or someone behind the scenes. The three actors had famously played the three most popular guest villains on the show i.e. the Riddler, the Joker and the Penguin. That, plus the fact that Otto Preminger himself had played Mr. Freeze on the series, too. The entire movie was a disaster from the word go. Preminger, long-known as one of the toughest, meanest directors in Hollywood, berated and browbeat the 78-year-old Groucho into using his old trademark greasepaint mustache in the film, instead of just allowing poor Groucho to be photographed in his own, natural one. After watching the physical bullying Preminger gave Groucho, Gleason warned him to never try those harsh tactics on him. The two went to the mansion of an actress in Beverly Hills one afternoon and ingested their two white tablets. The actress had only classical music and show tunes in her record collection, so, wanting a little music, they put on Bach’s Cantata #7. Groucho asked Krassner about the social background of the drug. Groucho liked some of his anecdotes about hippies and their taking of the drug. Krassner said many hippies had waited until the exact moment LSD was declared illegal (it had been legal until recently in California) and then as soon as it was officially “not legal,” they ingested it, just to take it illegally. The story greatly amused Groucho, and seemed to remind him of the Marx Brothers’ type of anarchy and insanity from their movies. Groucho related a story about one of his all-time favorite contestants on his TV quiz show You Bet Your Life. “A gentleman with white hair, on in years, but a chipper fellow,” Groucho recalled. “I inquired as to what he did to retain his sunny disposition,” Groucho said. “‘Well Groucho, I’ll tell you,’ the gentleman replied, ‘Every day I get up and I make a choice to be happy. '” Groucho never forgot the old man, his cheerful attitude, or his upbeat remark. Groucho gave forth his opinions on marriage (“like quicksand”) and then-president Lyndon Johnson (“Potato-head”). “What gives you hope?” asked Krassner. “Do you really believe that?” asked Krassner. Groucho munched on a fig. “I never thought eating a fig would be the biggest thrill of my life,” he declared. 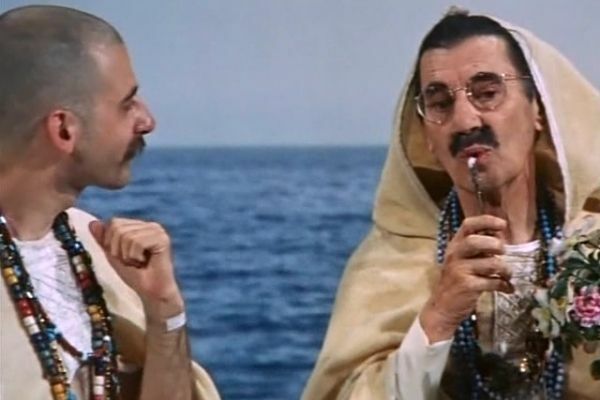 Krassner noticed that during the entire experience, Groucho held his trademark cigar in his hand, he sometimes smelled it, but never actually smoked it. Groucho admitted to having had a small crush on Marilyn Monroe when she had a bit role in the Marx brothers’ final film Love Happy. It was rumored that Groucho also sampled acid with Timothy Leary on another occasion. This rumor may be true, but is unverified. The above is the only verified account of Groucho Marx taking acid. You can see the full film on YouTube.